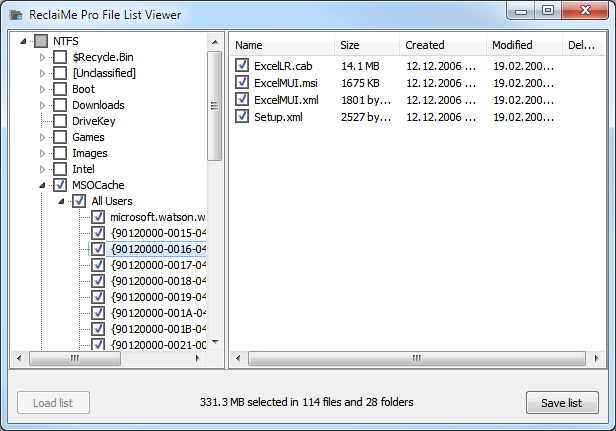 In the Files and folders window there are Export file list and Import file list buttons on the toolbar. Using these buttons you can save the current state of the folder tree and files along with all the marks to .CSV file or import the previously created file to ReclaiMe Pro. Such a feature is especially useful for data recovery specialists recovering data for a client who for some reason does not want to recover all the data but only part of it. In this case it is convenient to provide a client access to the list of the recovered folders and files so that he or she can select all the needed data and then load the client's marks back to ReclaiMe Pro for copying. Once you are satisfied with the quality of the recovered folders and files, you can click the Export file list button and save the current structure of recovered data to .CSV file. Then you can give the file to a client along with a small tool named ReclaiMe Pro File List Viewer (download). When the client launches the tool and loads the file you provided, he or she gets exactly the same folder tree and files and can mark the needed data, save changes, and return the file. Note that exporting file list requires saving the current state of the recovered process. That's why when you click Export file list, you are asked to specify first the location for the saved state file and then the location for the .CSV file. From these two files you should send only .CSV file to a client. You can load a file list by using the Import file list button only if you did not close ReclaiMe Pro. To import the file list in another ReclaiMe Pro run, you need to load both save and .CSV files in the Disk and image scan options window.